Of all Shakespeare's "problem" plays, none may be more problematic than Troilus and Cressida. For in it, the Bard awkwardly yokes together a savage parody of the Iliad with a poignant, but derivative, romance (the inconstant Cressida does not appear in Homer, or anywhere else in Attic literature; she is a medieval invention). The tone of the resulting amalgam has puzzled readers from the start - indeed, the Quarto edition of the text decided it was "history," while the Folio deemed it "tragedy" (even though many today consider it a peculiar kind of pitch-black comedy). Compounding the confusion was the fact that it seems Shakespeare's troupe never produced Troilus and Cressida; so even though its performance history has slowly burgeoned (and even ballooned in the past few decades), it may be true that it was always intended for the page rather than the stage. Which may give you some sense of the basic problem with this problem play: Troilus and Cressida is a travesty, yes, of Homeric heroics; but it is an elaborate, subtle travesty - indeed, some critics have called it Shakespeare's most sophisticated creation (I wouldn't go that far, but it's definitely up there). 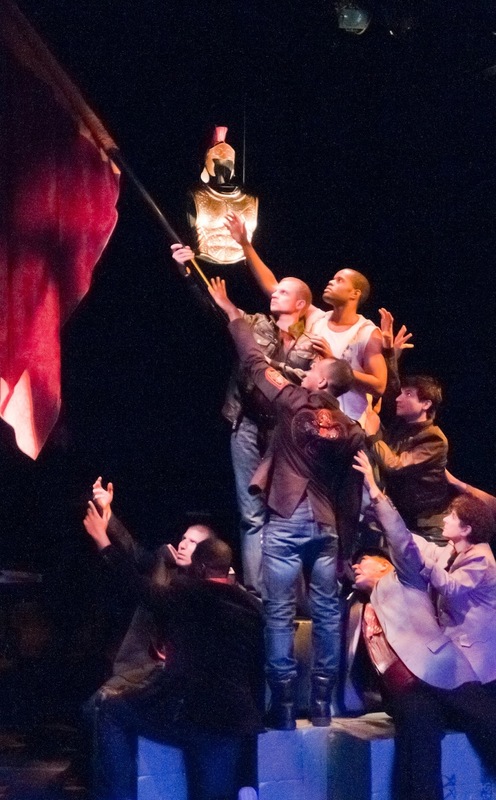 And the tension between the Bard's extremely dark themes and his exquisitely discriminating tone has thrown many a production into chaos (in fact I've never seen this play quite work), as it does the current version by the Actors' Shakespeare Project (at the Modern Theatre through May 20). It probably didn't help that this Troilus was directed by Tina Packer, the widely lauded founder of Shakespeare and Co., which has long been known for its hearty brand of Shakespearean brio. And while I won't deny Packer's productions have often packed a punch, her forte has always been rollicking, even gonzo, comedy; no one ever called the lady subtle - and they're certainly not going to start now. Not after this. For Packer has pounded Troilus and Cressida down into a really complicated, but essentially simplistic, screed against war - which it isn't, not really (in fact not at all, not at all). For at this particular phase of his career, of course, Shakespeare was simply beyond "simplistic," and at any rate, "war" is not his theme anyhow. His theme is inconstancy - he all but says so over and over - and he means inconstancy in both love and war (where, as everyone knows, all is supposedly fair). Indeed, what would have leapt out at any audience in Shakespeare's day about Troilus and Cressida (had it been staged then) seems to have been missed entirely by the Actors' Shakespeare Project, and that is that Cressida is just about the only romantic heroine in the canon who is sexually unfaithful (unless you count Cleopatra, but then she's a historical figure). Just btw, it's also hard to think of a romantic hero in Shakespeare who's untrue, either (although his men tend to be more feckless and inconstant than his women). Indeed, it's fair to say that for the Bard, fidelity was almost an artistic obsession. But as the slave Thersites sneeringly sums up the Trojan War, in Troilus and Cressida,"all the argument is a whore and a cuckold" - a unique environment for Shakespeare. But is the scurrilous Thersites really referring to only Helen and Menelaus, the fulcrum of this epic conflict? I don't think so. For Cressida, too, becomes a "whore" once she is a prisoner of war, and Troilus thus her "cuckold" - although they never actually married, did they (they never even seriously discuss that option), which makes their tryst another rarity in Shakespeare - and in some sense only a case of infidelity waiting to happen. But wait, there's more; Patroclus is explicitly described as Achilles' "masculine whore" - and we also learn that Achilles actually has a liaison going with a Trojan princess, too. Like the twins in Comedy of Errors, whores abound in Troilus and Cressida. Patterns of thematic twins are, of course, typical of Shakespeare in his late stage, and Troilus is as densely structured in this regard as anything he ever wrote. What's different here is that it's difficult to make sense of how the twins are to be morally categorized - or rather, we sense that Shakespeare himself is unsure how they should be categorized (a frightening prospect, frankly). For are Helen and Cressid and Patroclus really morally equivalent, the way the twins in the Comedy of Errors (or Lear and Gloucester, or even Hal and Hotspur) are? And if not, is there a moral structure that could accommodate them appropriately? Always till now in the full arc of a particular drama, the Bard has at least hinted at answers to such questions, but we remain permanently at sea in Troilus, whose namesake even asks aloud, when arguing over Helen's fate,"What's aught but as 'tis valued?" Hector has an answer to this, of course, which probably aligns with Shakespeare's - "Value dwells not in particular will;" - but Hector ends up dead, doesn't he (and perhaps tellingly, he leaves a wife but no mistress). And note Troilus's faith in market valuations are echoed by Cressida herself, who (unlike, say, the Marina of Pericles) lacks the inner resources to resist a push into something like prostitution, and essentially uses her lover's own words to justify his betrayal. To Cressida, if she is being valued as a whore, then she is a whore, and may as well act like one. (Yes, there is a wicked satire of libertarianism lurking in Troilus and Cressida, my confident millennial friends.) And it's some measure of the topsy-turvy quality of the play's environment that the heroine is first pimped by her own uncle - and then essentially by her own father, the calculating Calchas, in an obvious parody of the actions of every other father in the canon. The mismatched, and miscast, lovers meet. Thus it's quite easy to argue that Troilus and Cressida is all about making love (particularly free love) rather than war, and that it's a travesty of romance as well as violence (which casts it as a critique not of only the Greek heroes, but also of the long romantic shadow cast by Troy). But then it's literally love that's driving this particular war, isn't it. 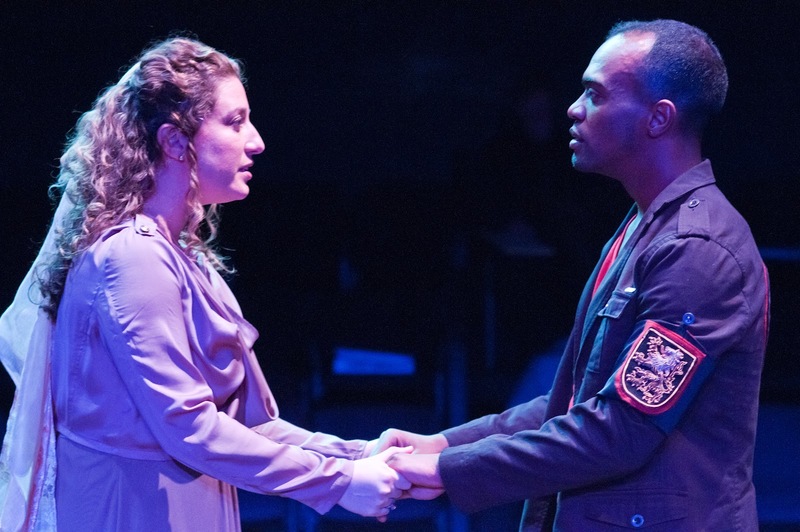 And so it's worth noting that the pivotal figure of Helen proves an elusive presence in the play - even in her big scene - and when she begs for a song of "love, love, nothing but love," the singer muses in response, "Is this the generation of love? . . . Why, they are vipers. Is love a generation of vipers?" An interesting question, particularly in the harems of Troy - but Helen doesn't answer, and Packer doesn't seem to hear it, indeed seems deaf (or blind) to this entire dimension of the play. To her, Helen is a squealing bimbette, and thus the central moral question of her elopement can be ignored - much like the essential instability of the romantic identities of Cressida and Troilus themselves (unsurprisingly, when they discuss their identities, it's always in the context of the legendary figures they expect to become, an intriguingly postmodern quibble right there). Thus Packer reduces the play to something like "Romeo and Juliet - on acid!," which couldn't be more wrong - although to be fair, she's only behaving like almost every other Shakespearean director and professor alive today. The theatre shrinks from sexual critique these days, and thus at least half of Troilus and Cressida simply cannot be interpreted in the classroom or on stage, which only raises the question whether modern Shakespeareans understand the Bard at all. Sigh. So in the end, not much is really going on in this production save garish, erratic gambits designed to keep its anti-war protest parade moving, no matter what. The text is spoken clearly at least, in that familiar, forceful Shakespeare & Co. style, but somehow this doesn't give the action much traction. The downside of the Packer style has always been its lack of lyricism (and oddly, this play is often quite lyrical); but what's more damning here is that even the sharpest linguistic clarity can't cut through the confusion of the production's misguided concept. Indeed, at intermission I heard two different couples arguing over whether Troilus was a Trojan, and Cressida a Greek, or the other way around; this is not a good sign (for the record, they're both Trojans, and certainly not Montagues or Capulets). There is one shockingly good turn in the show, however: Craig Mathers offers the most convincing Ulysses I've yet seen. Mathers is one of the best actors in the city (even though we don't see much of him), but I was still surprised at how far he got in this notorious role; he all but sailed through the character's lengthy orations, and slyly made the case in his ensuing machinations that the unromantic, amorally realistic Ulysses was often speaking in the Bard's own voice. (I'll admit that if Packer's concept was that Ulysses is the only complex character in the play, then I suppose you could count her production a success on its own terms.) I should also commend, I suppose, Ross MacDonald - another actor we don't see enough of - who is obviously a natural Shakespearean, and at least didn't make any obvious mistakes, but didn't bring much intriguing subtext to Hector. And surprisingly, the usually reliable Michael Forden Walker only did about as well by Thersites. There were plenty of other talented actors in this cast, but everyone else seemed to stumble. As the eponymous lovers, Maurice E. Parent and Brooke Hardman were almost amusingly miscast, and made little headway against their own natural presences, so their scenes were often wooden. Robert Walsh, who it seems is a naturally butch stoic, made an intermittently effective Agamemnon, but alas, he tricked out his Uncle Pandarus with all manner of actory tics while utterly missing the point of the role. Meanwhile the versatile Danny Bryck was stretched beyond his powers as Patroclus and Diomedes (Cressida's eventual Greek "seducer"), and as Patroclus, he was so busy playing "gay" that he didn't seem to realize that it's actually hero worship that's driving his affair with Achilles (De'Lon Grant's Achilles seemed down with the worship, but returned little of the love - another mistake). I won't go into the other performances, because most were just terrible, but rather obviously they were bad because they'd been directed badly. Still, the production does lumber along, which is something, I suppose; in aesthetic terms, it's sometimes as painful as the Trojan War, but at least it's a whole lot shorter.